The Canon CN-E 18-80mm T4.4 COMPACT-SERVO Lens combines the functionality of Canon’s EF lenses with the features and performance of their CN-E lineup. Designed for use with EF-mount cameras featuring Super 35 or APS-C sized sensors, the lens covers an incredibly useful 18 to 80mm focal range while maintaining a constant T-stop of T4.4 (f/4) throughout. Measuring 7.2″ long and weighing only 2.65 lb, the lens presents itself as a compact, lightweight option suitable for a variety of productions, from narrative work to run-and-gun documentaries. Notably, the lens is Canon’s first cine-style option to incorporate image stabilization and auto focus functionality when paired with Cinema EOS cameras. Further enhancing the versatility of this lens, Canon has equipped it with a servo drive unit compatible with industry-standard lens controllers, including Canon’s broadcast ZSD-300D and FPD-400D, for full zoom, focus, and iris control. Alternatively, you can outfit the lens with the optional ZSG-C10 Control Grip for ENG-style lens control and operation. Power is provided to the grip from compatible cameras via the EF mount. For non-servo zoom control, the lens features cine-standard 0.8 mod gears, as well as a rubberized grip on the focus ring enabling comfortable manual operation. 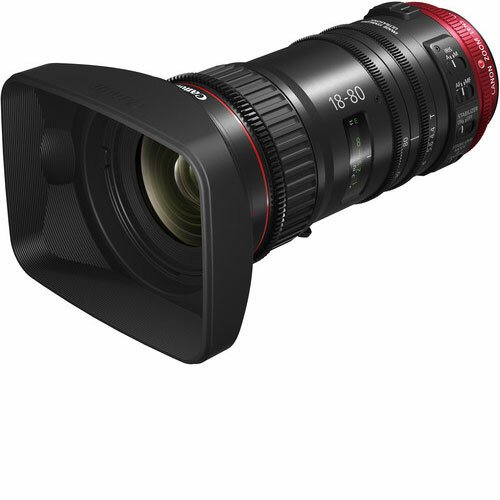 Canon CN-E 18-80mm T4.4 COMPACT-SERVO Cinema Zoom Lens is available for rent or hire from RENTaCAM Sydney.